Council Democracy: Towards a Democratic Socialist Politics. James Muldoon (ed.). Routledge. 2018. Councilist movements and theories have appeared widely at different historical conjectures as revolutionary attempts towards self-emancipation of the working classes. Historically, workers’ councils were first formed in Russia in October 1905 and later re-emerged much more broadly and militantly following the February Revolution of 1917. Later, workers’ council movements appeared numerous times in different periods and locations, such as in the post-World War I (WWI) era (e.g. in Austria, Germany, Hungary and Italy); in the 1950s-1970s period (e.g. in Hungary, Poland, Algeria, France, Chile, Portugal and Iran); and in the twenty-first century (e.g. in Argentina, Brazil, Venezuela and Greece). 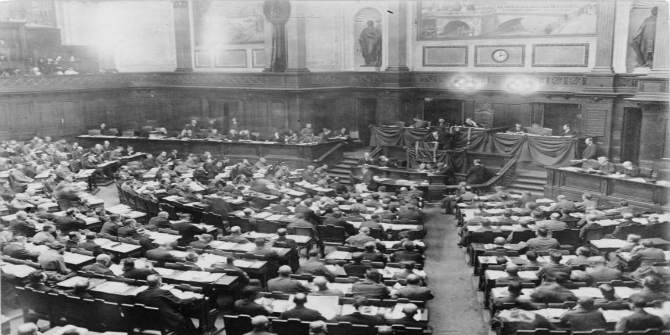 At a theoretical level, numerous intellectuals have engaged with conceptual analyses of councilist movements, including Ernst Däumig, Richard Müller, Otto Bauer, Max Adler, Karl Korsch, Antonio Gramsci, Anton Pannekoek, Herman Gorter, Paul Mattick and Cornelius Castoriadis. Nevertheless, the history of councilist movements and ideas have often been marginalised within the history of socialist thought due to the hegemonic presence of Marxist-Leninism and Social Democracy. 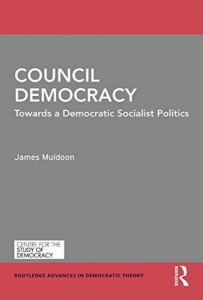 James Muldoon’s new edited book, Council Democracy: Towards a Democratic Socialist Politics, is a welcome attempt to not only reopen the discussion on councilist ideas and movements, but also provide a stimulating take on the phenomenon as a whole. Muldoon does this by bringing together many emerging scholars in the field of democratic theory whose contributions take the question of councilist ideas into new frontiers; hence, the particular characterisation of councilist ideas as ‘council democracy’. The twelve chapters of the book are structured into four parts: council movements in historical perspective; the relationship between council democracy and the question of the state and the problem of socialisation; council democracy in debates of radical democratic theory; and the relevance to contemporary strategies and movements. The introduction presents the key debates among the council theorists since the German Revolution (1918-19) and contrasts them with other dominant schools of thought, such as the Leninist model, and different traditions of democracy theories, such as minimal, participatory, radical, agonistic and deliberative democracy. Muldoon conceptualises council democracy as seeking to ‘reconcile two fundamentally distinct principles: workers’ control over production, and a universal conception of democracy’ (10). This not only implies a different social relation of production, but also a different notion of representation. These two axes lay out the analytic foundation of the book within which the questions of socialisation, state and democracy are located. The introduction, however, falls short of clarifying in what ways the council democratic ideas evolved in different periods and how the fundamental notions that are used to conceptualise them should be historicised to analyse the movements in particular. In other words, how are the radical transformations that capitalism has undergone since WWI reflected in the analytic concepts of and actual debates within council democracy? This is particularly important since the chapters of the book span over the three major periods of councilist movements: the German Revolution (1918-19); the Hungarian Revolution (1956); and the Bolivarian Revolution (the 2010s). The two chapters in the second part of the book on historical perspectives focus exclusively on the post-WWI experience. Donny Gluckstein’s account of the development of workers’ councils in Europe in Chapter Two seeks to answer the question of why the wave of councilist movements appeared in cities with large metallurgical industries, such as Petrograd, Berlin, Glasgow, Vienna, Budapest and Turin. Although Gluckstein’s account is intriguing on its own, it is not substantially different from his 1985 book, The Western Soviets. The problem with the sharp dichotomy that he continues to make between the councils and parliament is that it not only lacks support from other historical studies of the movements (as in fact shown in Chapter Three, by Gaard Kets and Muldoon, which explores the councils in Hamburg), but also stands in fundamental conflict with the interventions that the majority of the chapters in the book intend to make to overcome exactly such a dualism at the level of theory (Chapters Six and Nine) and strategy (Chapter Five). Gabriel Wollner’s discussion in Chapter Four of the democratic deficits of capitalism due to the lack of workplace democracy and the state’s structural constraints to implementing democratic decisions as rooted in private property rights in the means of production is a well-known view in the Marxist literature. The strategic dilemma that emerges in the question of where the control rights would reside (i.e. in the workplace or the state) that would lead to a genuine overcoming of these democratic deficits is rather a simple variation of the infamous ‘socialisation dilemma’ (i.e. whether the ownership of the means of production should reside in the hands of the workers at the point of production, leading to syndicalism, or in the hands of the state, resulting in statism), a useful overview of which is provided in Chapter Five. However, the contribution that Wollner makes is perhaps found in his translation of this issue in terms of the question of legitimacy and authority as the basic requirements of any democratic system. He goes on to argue that council democracy is able to overcome the democratic deficit. Nicholas Vrousalis picks up the socialisation dilemma and, after a historical overview of the key debates, offers a strong critique of Karl Kautsky’s proposal alongside what he calls a ‘Madisonian solution’ (essentially akin to that of Adler) based on a constitutional dyarchy by having a parallel system of councils and a parliament. He argues that this solution overcomes the socialisation dilemma without repeating the strategic pitfalls of Kautsky’s proposal. However, besides a lack of clarity regarding the exact role of parliament in solving the socialisation dilemma, Vrousalis’ account seems oblivious to the political power that antagonistic forces (including some of the ‘workers’ parties’, as we saw in the case of the Social Democratic Party (SPD) in Germany) might play within the parliament to undermine council democracy when he states that ‘whenever workers’ parties obtain majorities in both council and parliament, the agenda of freedom is on […] when workers’ parties lack majorities in parliament, by contrast, freedom is on standby’ (102-3). Michael J. Thompson in Chapter Six attempts to merge the council tradition with republicanism to retain ‘a layer of political realism by holding on to institutions such as the state, constitutionalism, and the rule of law’ (109). This is in sharp contrast with classical theorists who saw the abolition of the state and the establishment of self-governing, spontaneous and direct participatory forms of social organisation as essential characteristics of council democracy – what Thompson pejoratively calls the ‘utopian interpretation of workers’ councils’. The schematic details of his proposal are akin to classic proposals for a federalist structure of councils in conjunction with the parliament. (A variation of such a mixed constitution is also found in Chapter Nine, by Benjamin Ask Popp-Madsen, as it presents the evolution of Claude Lefort’s characterisation of the councils within the Hungarian Revolution.) Thompson’s emphasis on the political nature of the councils as institutions (as opposed to, for example, their transformative effect on human agency) and the possibility of such revolutionary struggles within the structure of the modern state are important points when we think about the democratic path to achieving a stable council democracy. In sharp contrast, we encounter the highly ontological and essentially apolitical conception of councils in the works of Castoriadis and Hannah Arendt in Chapters Seven and Eight. Unfortunately, Chapters Ten and Eleven remain abstract and caught up in the technicalities of democratic theories or make rather puzzling historical extrapolations. Dario Azzellini’s work in Chapter Twelve, on the other hand, gives a concrete sense of the contemporary manifestations of the council tradition in concrete movements in worker-recuperated companies in Venezuela and Kurdistan, though his analysis of these movements does draw rigidly on what Thompson called ‘utopian interpretation’. Some of the traditional tensions in the council democracy literature are replicated among the chapters of this book, which is not unexpected from an edited collection. Perhaps these tensions can only find situated resolutions in the particular context of actual movements. Nevertheless, Council Democracy is an important contribution to the revival of this deeply emancipatory form of democratic socialism. Babak Amini is a PhD candidate in the LSE Department of Sociology. His research topic is on council movements in Germany and Italy after World War I. He is the co-editor of the forthcoming book, Routledge Handbook of Marx’s Capital: A Global History of Translation, Dissemination and Reception, and the editor of The Radical Left in Europe in the Age of Austerity (Routledge, 2016). He is also the Assistant Editor of the book series, Marx, Engels, Marxisms, and on the editorial board of Socialism and Democracy.